Nature documentaries, especially when you grow up with them, have a way of cultivating a deep state of wanderlust for distant, remote corners of the world. Of all of these faraway lands, tropical rainforests hold a special place in the imagination of your inner child: they are places where amazing tree canopies shrouded in mist and clouds are teeming with hundreds of species of birds, primates, lizards, and snakes; where thunders rumble in the distance and the rain falls thick, swelling up rivers and bringing life to these remote landscapes. When we set foot in Gunung Leuser National Park in Sumatra, Indonesia, we needed to readjust our expectations to reality: where had all those hundreds of wildlife species we were seeing in documentaries and atlases gone? In fact they were all there, but we could hear them more than we could see them: the constant buzz of giant cicadas, the haunting calls of hornbills, the loud chitchat of endemic Thomas’s leaf monkeys, and the tree canopy moving under the weight of Sumatran orangutans. Slowly, our eyes began to adjust with help from our guide and we began to see all this amazing wildlife around us, hidden by the dense vegetation, but it still felt somehow incomplete. Then, on our second day in the national park, we heard the calls of siamangs (largest gibbon species) in the distance and all that sense of wonder building up since childhood came rushing over as if we were explorers from the past, when the Earth was still a great unknown. It stopped us in our tracks and we just sat there, listening to them approaching, but never getting close enough to be within sight. To this day, they remain the most mesmerizing wildlife species we never got to see. Gunung Leuser National Park’s size is about 2.4 million acres (1 million ha), shaped like two lungs in the middle of a much larger area of high importance for conservation: the Leuser Ecosystem. Together with two other national parks, it forms part of the UNESCO World Heritage Site known as the Tropical Rainforest Heritage of Sumatra — a place with an estimated number of 10,000 plant species, 200 mammals, 580 birds, and 95 reptiles and amphibians. This national park was designated in 1980, but that didn’t stop the destruction encroaching upon it from illegal logging, infrastructure development, poaching and oil palm plantations. Luckily, the past few years have seen a major improvement in the protection of wildlife and forest habitat from poaching and illegal plantations, and local governments have agreed to cooperate in the protection of the larger Leuser Ecosystem. All the species in our photo story exist today still thanks to the work of amazing organizations and initiatives. They have been raising awareness internationally of what is now known as “the last place on Earth” where Sumatran orangutans, tigers, elephants and rhinos coexist, while also finding local solutions to help communities understand the value of protecting the Leuser. The impact of our choices at home, from reducing or eliminating consumption of products made with palm oil to buying used furniture or avoiding those made from unsustainable tropical wood, can help with the protection of this beautiful wild corner of the planet. When visiting, make a point to find guides that respect wildlife, spend locally without demanding the cheapest prices, and enjoy the wonder of being in one of the most biodiverse forests in the world. The quintessential image that comes to mind when thinking of tropical rainforests: a thick tree canopy with mist rising from it. If you’re accessing Gunung Leuser National Park from Bukit Lawang or from Ketambe, you’ll find yourself mostly in a tropical lowland forest habitat. This means that you’ll be walking at an altitude lower than 3,200 ft (1,000 m), through a forest dominated by dipterocarp tree species which can reach almost 200 ft (60 m) at maturity. These emergent trees rise above the canopy and sustain an ecosystem of strangler figs, lianas, and buttress roots which help them anchor their weight in the soil and extract nutrients from the surface. Between this tallest layer and the second one, of shorter trees, is where most action happens: fruits and flowers above the canopy attract a large variety of wildlife, especially during the fruiting season (in Sumatra this happens roughly between November and February). This is where orangutans, siamangs, and most bird species including hornbills spend most of their time. Closer to the ground the tree species become shorter and their crowns no longer meet each other, and shrubs make bushwhacking very difficult. This thick ground vegetation also does a good job hiding wildlife, and it is in the remote parts of the Leuser Ecosystem at ground level where Sumatran tigers, elephants and rhinos, as well as Malaysian sun bears and other species live, keeping a good distance from any trace of human presence. A model study over a 30-year period has shown that in a scenario where the Leuser Ecosystem was completely conserved it would bring locally US $22 billion in ecosystem services and tourism money, a value of almost US $6 billion more than in a scenario where the ecosystem was replaced by activities involving deforestation. This monkey species, also known as crab-eating macaques, can easily be seen on many islands of Indonesia, sometimes living in large groups that make their way into human settlements to forage for food. Though you’ll likely always spot at least one male that appears to dominate the troop, they are actually matrilineal and males are just temporarily there for reproduction. Females share a strong social order with one dominant female which could maintain the position for her entire life and pass it on to her next generation. Macaques are opportunistic and will gather around campsites and along trails to steal food, and they often display aggressive, unexpected reactions when approached. Although this squirrel might appear to look just like a black squirrel, the species has actually a very bright coloration: the underpart is a rusty red color surrounded by a band of white fur, while the back is charcoal black. This is the reason why they are also known as the Asian tri-colored squirrel. When they want to communicate with their own kind they emit a piercing whistle sound, and when they want to be left alone they do the typical squirrel trill. We were lucky to spot this squirrel for more than a few seconds during one of the hikes outside Ketambe, as they are skittish and you will mostly hear rather than see them up in the canopy. This beautiful green lizard is a species native to Southeast Asia and a common presence in countries including Indonesia, Malaysia, Thailand, and Burma, especially in primary and secondary forest. They can change their color to a darker green, brown or grey when feeling threatened, although this guy seemed undeterred by our presence and stood his ground inspecting us rather curiously. As many lizards do, it stared at us until we turned our heads for a second then disappeared like magic and we never saw him again. They can reach a total length of 22 in (57 cm). The first and last time we spotted a hornbill during our trip to Sumatra, as we were there when trees had shed their fruit and the birds were much less visible. These beautiful, prehistoric-looking birds are a quintessential presence of the tropical rainforests of this part of the world. Many local cultures venerate them, but also praise them for their meat and the strange and colorful horn on their heads. They are frequently poached and threatened by loss of habitat, which has led to a deterioration in the conservation status of the species. When talking about them with one of our guides, he told us that collectors from Singapore and Hong Kong often come here to obtain the horns of hornbills and sell them for thousands of dollars on Asian and European markets. With the option of making a sustainable living from tourism for the long term, there is less and less motivation for guides to help with illegal activities like poaching to make a one-time earning which can threaten their livelihood. Hundreds of species of fruiting trees and strangler figs ensure the livelihood of most species of these tropical forests. Trees in northern Sumatra share their bounty every year, roughly between November and February during the wet season. However, every few years a massive flowering and fruiting event happens, known as a “mast”. During seasons of mast there is an abundance of fruits on the ground and a feeding frenzy in the canopy. Mast events are a way for dipterocarp and fig species of trees to ensure that their seeds survive the predators which eat them, by providing these predators an instance with more fruit that they can eat. Deep in the rainforest outside Ketambe, a narrow trail from the maze of pathways leads to an amazing tree: a giant banyan, a species which is considered one of the largest plant organisms on the planet. These figs take root on a host tree and surround it entirely with a complex web of roots and trunks. Host trees eventually die and leave the banyan hollow inside, which then becomes a welcomed shelter for many species in the rainforest. There are some 750 species of figs with the banyan being one of the largest, each pollinated by its own highly specialized species of tiny wasp. Fig fruits are the lifeline of the rainforest, providing food for almost all species of birds, primates, insects and bats. In India there is a specimen of banyan whose roots and canopy have spread over almost 5 acres (2 ha). Stumbling upon such a giant of the rainforest and getting to stand by its large roots was one of the highlights of our experience in the national park. The small village of Ketambe is the perfect gateway to access the central part of Gunung Leuser National Park, much less visited than its counterpart to the east, Bukit Lawang. The few guesthouses available all work with local guides, but not all guides show the same knowledge and respect toward the forest. We witnessed many of them leaving behind garbage at campsites or encouraging their guests to get close to wildlife. As with anywhere in Indonesia, the choices we make as visitors can be the difference between tourism as a tool for conservation and sustainable development, and tourism as a destructive activity. Said was one of the best guides available in Ketambe, truly dedicated to his work and concerned with the protection of Gunung Leuser National Park. Tourism in the national park is one of the main ways in which local communities in gateway towns and villages benefit economically from having this large conservation area in their backyards. Local guides, guest houses, inns, hotels, outfitters, drivers and small warungs and restaurants all cater to a growing number of visitors. These people’s livelihoods are therefore connected with the wellbeing of the national park and its species, aside from the ecosystem services it provides such as clean water, flood retention, food sources and more. We talked to several guides and found that they were happy and proud to lead people from all over the world on the lands that they grew up exploring. However, in an area where there is a lack of regulations and where we didn’t see one park ranger patrolling, guides and their guests make all the difference. Unfortunately, there is a real need for better practices in the more traveled areas of the national park, and change has to begin with visitors showing respect for wildlife and following “Leave No Trace” principles so that the guides do not feel compelled to behave irresponsibly to satisfy their customers. 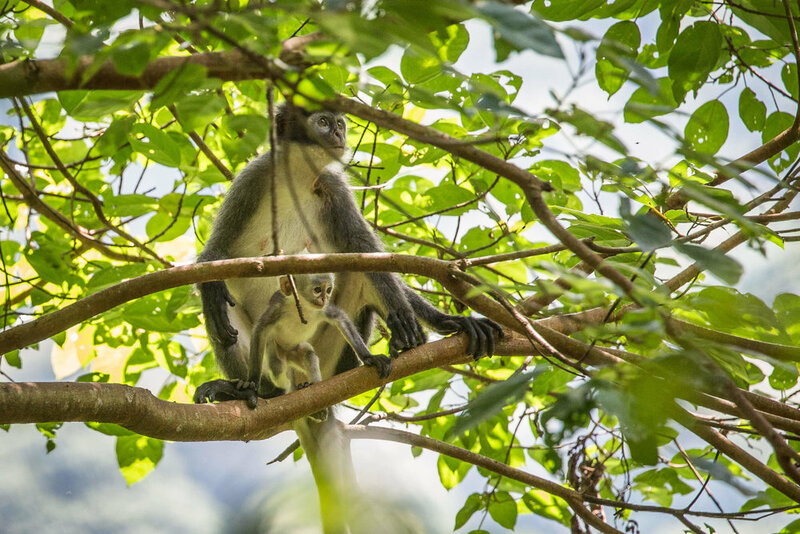 We first spotted the loud Thomas’s leaf monkeys across the Bohorok River outside Bukit Lawang, jumping through the branches of a massive tree. Their acrobatics are mesmerizing to watch because they are some of the best jumpers out there, a species endemic to northern Sumatra whose range overlaps the Leuser Ecosystem. Thomas’s leaf monkeys, also known as Thomas’s langurs, belong to the order of primates and are listed as Vulnerable by the IUCN due to loss of habitat. Female Thomas’s leaf become sexually active around the age of 4 and give birth usually to one baby every 1.5 to 2 years. We saw this mother and her beautiful baby in the wilder side of the national park outside Ketambe. They were part of a large troop, likely led by one alpha male and surrounded by many females and their young, as is the case with most Thomas’s leaf monkey troops. While camped in the forest in Gungung Leuser National Park, Said took us on a night hike to experience this amazing habitat at the time when all sorts of critters become active. Among them the nicest sightings were those of the numerous frog species either making their way from tree to tree or hopping on the ground along the streams. While fascinating, night hiking in Gunung Leuser reveals a world of critters not for the faint of heart. Some crickets, frogs and katydids are among the “friendlier” sights, but there are plenty of spiders, millipedes, centipedes and other bugs that might make you step aside. However, out of all of them the only ones guaranteed to be a nuisance are the ever-present leeches. According to everything that we could find online, this appears to be a river toad, also known as the Asian giant toad. The latter name is funny because this toad was tiny, but it appears that juveniles develop into pretty large adults that can reach 8.5 inches (22 cm) in length. These moths are a common presence along the rivers in the national park, and because they are active during the day many people mistake them for butterflies. The yellow leopard moth is a species found in South and Southeast Asia. The beautiful Gurah River is the site of the most busy camping area. During daytime it’s a common stop for lunch for day hikers, which is why it’s also the place where some people leave behind garbage. Together with Said, our guide, we collected some of it and brought it outside the park. Orangutans are an umbrella species in the conservation world: sharing 97% of our human DNA, they are ambassadors for the plea of forest destruction in Indonesia. If we pay attention to their struggles and spring into action to protect them, we basically protect their habitat which in turn saves hundreds of species from the threat of extinction. Aside from palm oil plantations that have set fire to forests and peat bogs in the Leuser Ecosystem and advanced into sensitive areas, orangutans are also at risk from logging and poaching. In the 70s a rehabilitation center was established on the Bohorok River in Bukit Lawang, where dozens of rescued orangutans were prepared to return to the wild in what would become the Gunung Leuser National Park. Up until a couple of years ago, the feeding platforms at the rescue center were open to the public for daily feeding of the orangutans nearby Bukit Lawang, who would return here to supplement their nutrition. This practice eventually ceased both because the semi-wild orangutans have become more independent and apparently due to the way in which the center was run. Therefore, the orangutans you would likely see during a day trip from Bukit Lawang are rehabilitated, semi-wild individuals that have been released into the forest after going through traumatic experiences in their young years. They are accustomed to humans and associate them with food, a fact of which a lot of guides and visitors take advantage to get closer. The behavior of these apes living close to Bukit Lawang has been altered by their contact with humans, and the survival rates among their offspring is significantly lower than among their wild counterparts. Of all, Mina is the most famous orangutan around the entire national park. She has a reputation for a short temper and for an assertive way of demanding to be fed by guides. Often seen walking on the ground, which is not not common in wild orangutans, she is as intimidating as she is beautiful. Our guide, Wanda, told us that she has been an excellent mother for her babies and that she likely suffered a traumatic experience which has made her more aggressive. Orangutans like Mina and like all the ones living close to Bukit Lawang are a reminder of the destruction of biodiversity happening in the Leuser Ecosystem, but also a beacon of hope that some wrongs can be righted, though imperfectly. Accoding to our guide, these two were both Mina’s offspring. We watched from a distance as they played together, filled with joy in each other’s presence. Meanwhile, Mina had laid on the ground pretty far from us, but keeping watch. Female orangutans begin breeding at the age of 15 or 16 usually, and rear their young until they are 7 years old. They have babies every 6 or 7 years, which means that sometimes a new baby comes into the life of a mother still rearing her young one. Orangutans are solitary, but females and juveniles will often hang out together and form temporary groups. Alpha males are always solitary once reaching maturity and spend time in the presence of females only during mating periods. Unlike orangutans nearby Bukit Lawang, those seen in the forest close to Ketambe are wild and much less interested in interacting with humans. The eyes of your guide will make a big difference in spotting them high up in the tree canopy, and trekking around offers no guarantee of orangutan sightings. We were lucky during day 3 to see this individual descending lower from the canopy due to rain. We did see several others, but usually up in the tree tops. There are three species of orangutan: two endemic to Sumatra — Sumatran orangutan (P. abelii) and the recently discovered Tapanuli orangutan (P. tapanuliensis); and one endemic to Borneo in Indonesia and Malaysia — Borneo orangutan (P. pygmaeus), which has three subspecies. This subspecies of the common imperial butterfly appears in Indonesia only in NE Sumatra and is more commonly found in peninsular Malaysia. They are small, but a really impressive sight, with their long tail subtly moving to distract the attention of potential predators away from other vital body parts. These pretty little tropical forest denizens are part of a subfamily of butterflies known as the hairstreaks. Before reaching the entrance of the national park from Bukit Lawang, visitors walk through a rubber plantation where a large troop of Thomas’s leaf monkeys have settled, partly because they feed on the fruit of rubber trees and partly because guides and tourists sometimes throw them some food as well, which is unfortunate. Our guide explained that the owners of the rubber plantation have no issue with the monkeys being there because the fruit doesn’t have commercial value. Rubber plantations used to be much more common in the past in this region, and they attracted a variety of species because many plants can grow alongside the rubber trees. Oil palm plantations are, by comparison, ecological deserts. The only thing that is edible for animals are the fruits, and that’s also the crop that humans exploit, which is why all wildlife is treated as a pest. However, rubber plantations growing in tropical areas are also a cause for deforestation and loss of habitat, which is why there are many organizations ringing the alarm that furniture made from rubber wood is not as “sustainable” as it is usually labeled by providers. This species of flying lizard is native to Southeast Asia and in Indonesia it’s found only in Sumatra and Borneo/Kalimantan. Like all lizards in the Draco genus, they are excellent gliders and can be seen “flying” from tree to tree for several feet. Their “wings” are known as patagial membranes. This beautiful male grasshawk dragonfly was very active in the early morning, probably on the lookout for mosquitos, small wasps or ants which compose its diet. Females are a duller brown or grayish color. The species is widespread in Asia and mainly breeds at altitudes over 3,200 ft (1,000 m).